During the wintertime and in hot, dry climates, the air inside your home can feel as dry and parched as the desert. That’s why adding moisture to your indoor air can greatly improve your comfort. It’s also beneficial in other ways. For example, you may be experiencing dry skin and hair, chapped lips, or even itchy eyes and nasal passages. And, your home’s furnishings may be suffering, as well. Dry air absorbs moisture from furniture, wood floors, woodwork, paintings and musical instruments. The addition of a humidifier is the perfect remedy. 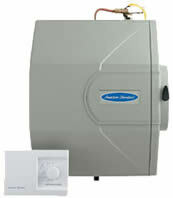 American Standard humidifiers are designed to add just the right amount of moisture so you can be comfortable. Click here to download a complete brochure.